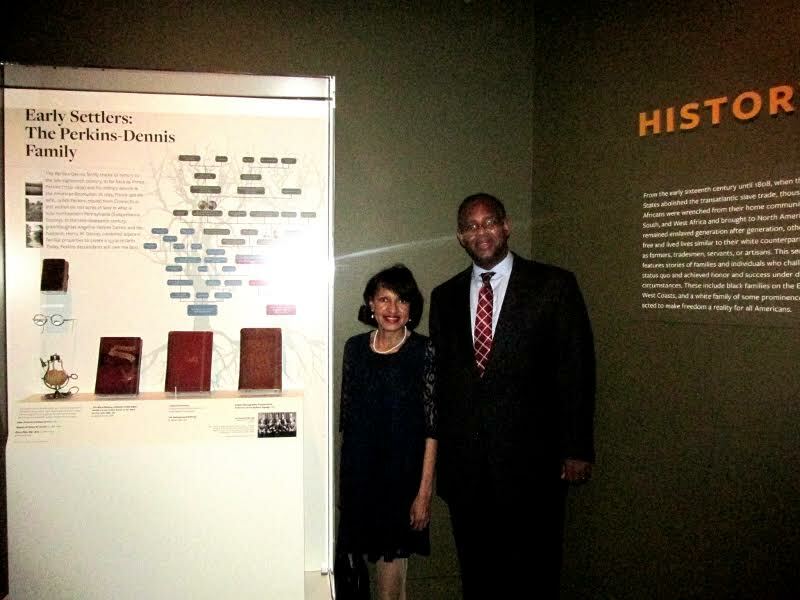 Perkins-Dennis direct descendants Denise Dennis and Darryl Gore pose next to exhibit “Early Settlers: the Perkins-Dennis Family” at the Smithsonian’s National Museum of African American History and Culture’s preview gala of exhibition, Through the African American Lens: Selections from the Permanent Collection, on May 6, 2015. The exhibition is on view at the National Museum of American History until NMAAHC’s new building opens in 2016. The Dennis family is honored to have a collection of their ancestor’s nineteenth century artifacts featured in the Smithsonian Institution’s National Museum of African American History and Culture’s (NMAAHC) exhibition Through the African American Lens: Selections from the Permanent Collection, which opened at the National Museum of American History in Washington, May 7, 2015. “Early Settlers: the Perkins-Dennis Family”, the first exhibit in the exhibition, features the family tree dating from 1700 until the present, artifacts, photographs, and nineteenth century books that belonged to the family and were bequeathed to subsequent generations. Dennis family descendants Edith Dennis Moore Stephens, Denise Dennis, Darryl Gore and daughter Hope; Lonnie Moore, III, his wife Shante and children Lonnie Moore, IV and Lonae who described her impressions of the event (see link) represented the family at the historic preview-opening gala on May 6.